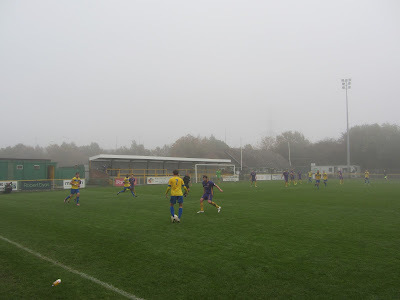 My twenty-third ground of 2015 was on Sunday 1st November at Ship Lane in Aveley, Essex. 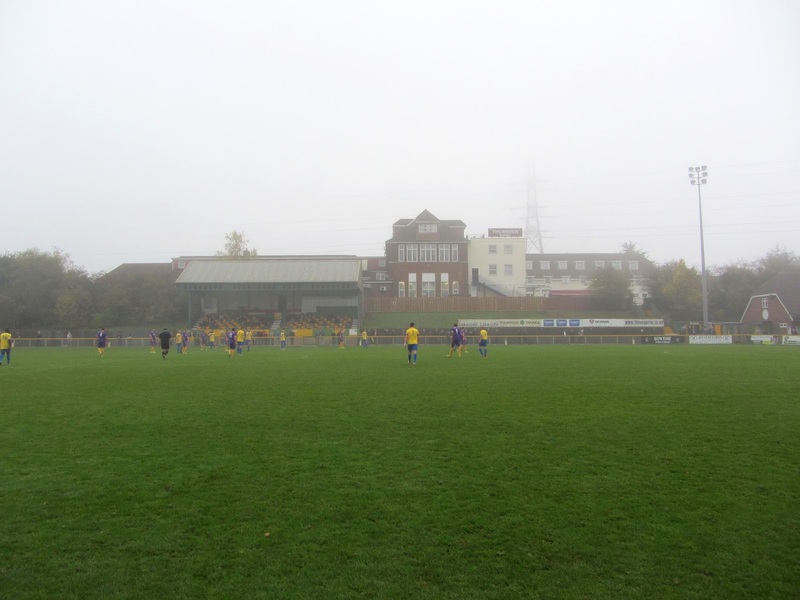 The match was Romford vs. Slough Town in the F.A. Trophy 1st Qualifying Round. Ship Lane borders the M25 Motorway just north of the Dartford Crossing and west of Lakeside Shopping Centre. The nearest railway station is 1.5 miles east at Chafford Hundred though there are more convenient connecting bus services from Rainham station to the west. The venue has been home to Thurrock FC since 1985 with Romford groundsharing at present. The south-east side of the ground borders the Thurrock Hotel complex with the Lakeside Stand built into the grass bank which separates the two premises. The stand has around 300 seats including separate sections at the back for media seating and home and away officials. Next to this seating there is a hospitality box. The rest of south-east side of Ship Lane is uncovered hard standing. At the northern corner there is a snack bar and the southern corner hosts a club shop and programme outlet. Adjacent to this is the Fleet Inn clubhouse which sits in the corner with the south-west side. The south-west area of the ground has a shallow covered concrete terrace for its whole length barring a small gap in the middle for an exit. 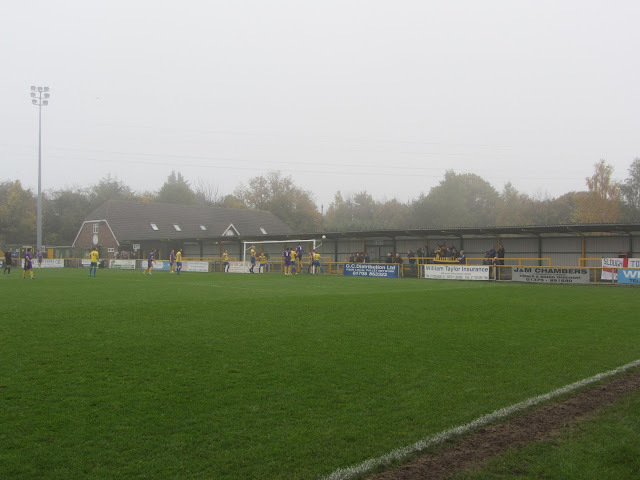 The north-west section of Ship Lane has a covered concrete terrace which runs the length of the pitch with a strip of uncovered standing in front of it. Around a quarter of the stand is taken up by 180 seats which have been built on top of the terrace. This stand also has a TV gantry on top of the middle section of the roof. 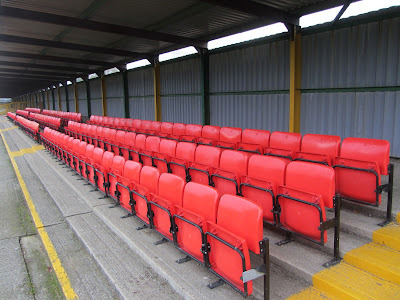 Another covered concrete terrace takes up around half of the north-east area of the ground - this stand is located directly behind the goal. Next to this is a club building which contains the dressing rooms. The game was an F.A. Trophy 1st Qualifying Round tie between Isthmian League Division One North side Romford and Southern League Premier Division side Slough Town. 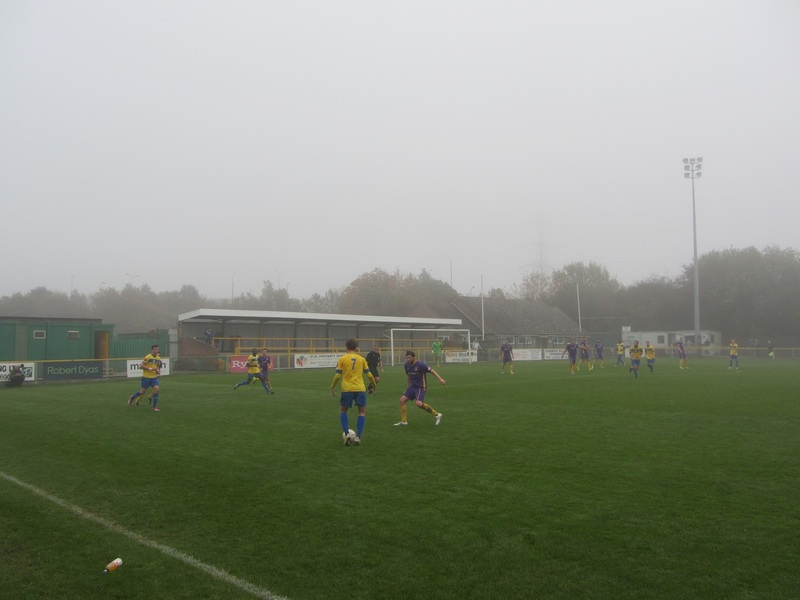 The team from the Southern League showed their quality in the foggy conditions of the first half as they dominated proceedings. Slough only took 6 minutes to get on the scoresheet as the ball was crossed into the box allowing Dan Hicks to head into the path of Adrian Hollis who shot in from a couple of yards out. Romford then had a couple of lucky escapes as Lewis Putnam and Dan Hicks both hit the woodwork for Slough in the following 10 minute spell. Hicks did manage to make it count in the 28th minute as he backheeled a drilled shot from Warren Harris into the bottom corner of the net. The away side extended their lead in the 52nd minute when Lewis Putnam whipped in a low cross from the left wing and Charlie Mpi scooped the ball into the roof of the net from a couple of yards out. The final goal came in the 74th minute when substitute Gurkan Gokman crossed from the right wing for Putnam who brought the ball down and smashed past the keeper from 12 yards. With the game over as a contest the hosts had their most positive spell in the closing stages. George Woodward hit the post from a free-kick in the 81st minute and Romford then missed two great chances before the end. Slough were able to retain their clean sheet as they recorded an easy win to take them through to the 2nd Qualifying Round.